Lacunae Musing: Nice to be Home? On our way back to Florida, we spent a few days in Asheville, NC, one of our favorite places, the mountains being such a contrast to the horizontal topography of our home. While taking a walk in that area we met someone who lived her entire adult life in Florida but had moved to Asheville to be closer to her grandchildren. When she heard we lived in Florida she commented that the reason s he misses her old home is she can no longer see the moonrise until it is high in the sky, the mountains dominating everything. That is what she missed the most. 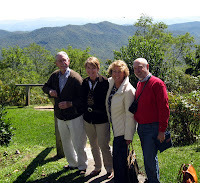 In Asheville, we visited with our friends, Irene and Pete, who also relocated there from Florida a few years ago. They now have second thoughts about having made the move while sometimes I have had second thoughts about moving to Florida from Connecticut. Perhaps one’s preference boils down to a whimsical perspective on the moonrise. Unlike the federal government, which can run deficits ad infinitum, state and municipal governments can’t print money and must have a balanced budget. So far so good. During this Great Recession, with declining receipts from sales and property taxes, they must either cut budgets or increase revenue. After years of bloated budgets, thanks to the chimerical prosperity since the last downturn, any cutback would have to be drastic to align itself with reality. The path of least resistance is to find ways of separating the taxpayer from his money in a stealth-like fashion. 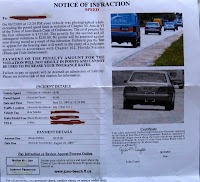 Case in point, we returned to multiple notices of a speeding ticket (made out to me, although my wife was driving) from our neighboring community, Juno Beach. This ticket was issued by an automated camera in the back of a van operated by LaserCraft, a company in Georgia. One is instructed to send the $125 fine to Georgia; probably LaserCraft getting the majority and Juno Beach the smaller share, but a small percent of something is better than 100 percent of nothing. This is the most nefarious kind of revenue raising tactic, with the taxpayer being forced to pay a fine without being able to face the accuser (there is a $50 fee to file an appeal, one you are warned you are sure to lose). Non-payment results in being turned over to a collection agency, with all the attendant credit history ramifications. The “evidence” is two photographs of our car clearly showing it in front of and behind other cars in a lane so presumably every car received a ticket. Desperate economic times dictate desperate tactics for municipalities, and this is one of the worst. Lest one thinks that this is typical FloriDUH and it can’t happen here (wherever that might be), if Juno Beach gets away with this (there is a suit in court to overturn this), other cities will surely follow and why not automated cameras on Interstates as well? Then, as our Florida home is our primary residence, it is “protected” under the Save our Homes act, the property tax increase one year over the next being capped at 3% or to the Consumer Price Index, whichever is less. Read the fine print – that is during good times only. Palm Beach County property market value has decreased so much that it has simply frozen or reduced the “appraised value” of homes (thereby staying within the 3% cap), and increased the tax rate to take up the slack. (From the Palm Beach County Property Appraiser: A property's assessment could stay the same or go down but property taxes could go up any given year because of millage increases levied by your local taxing authorities). Why bring a budget in line with the economic times when it is easy to pick the pocket of the taxpayer? PBC tax rate will increase 15% over last year. Bottom line: if you want job security, retirement and health insurance benefits, work for your local government.